One Way I Made Money Doing Palm Reading. How I Made Money Doing Palm Reading, and Had a Lot of Fun! Reading hands will not make you rich. At least it didn't make me rich. But I don't know of any job that is more fun and satisfying. Not many jobs provide as much personal contact and opportunity to help strangers, family, and friends in such a short time. In this page, I will show you how I operated my hobby (not really a job) of palm reading to make money, and at the same time had a fantastic amount of satisfaction and fun. 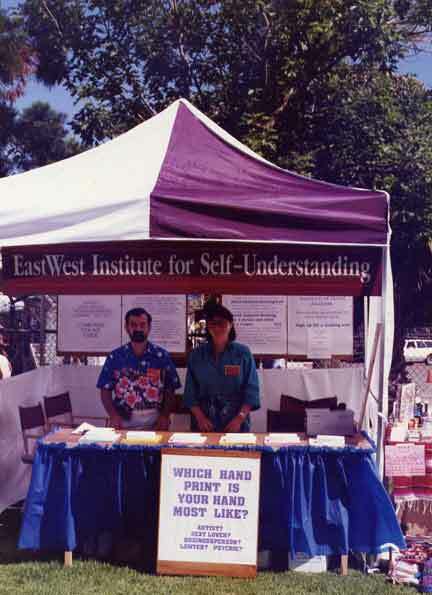 It all started in Northern California in 1980"s. Back then I was a full-time college teacher (subject: electronic communications) but I was very interested in connecting with people to share my knowledge about hands. I had attended Hand Analysis classes in Marin County at the International Institute of Hand Analysis one weekend a month for about three years. During most of that time I was developing my book, "It's All In Your Hands: Hand Analysis Guidebook to Self-Understanding." 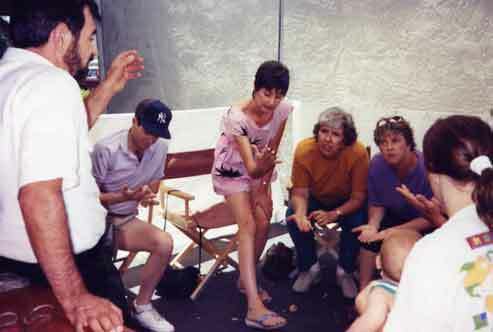 At some point I started holding palm reading classes where I lived in Sacramento, California. My book was used in a class setting for people who wanted to join in the fun reading hands. Shown here is an enthusiastic group of eager learners. To provide practice outside the classroom, I created a program whereby my students and I could do palm reading on the public. Annually during the spring, summer, and fall I rented booth space at numerous arts & crafts fairs, psychic fairs, and appropriate public events. We went south as far as Monterey, east to Carson City,Nevada, north to Mt. Shasta area, and to the west around the San Francisco and Marin County areas. Usually, there was myself and 3 to 6 of my students manning the booth doing palm reading Friday thru Sunday. We worked long days but we got to meet a lot of people and had a lot of fun. We even made some money while having fun! I had purchased and/or made the necessary materials to present ourselves as professional and serious about our trade. We wanted to separate ourselves from the "Gypsy fortune teller" type of palm readers. It didn't take long to figure out what worked best to get the crowd to stop and make contact with us, instead of walking by at a distance and just looking and wondering what we did. 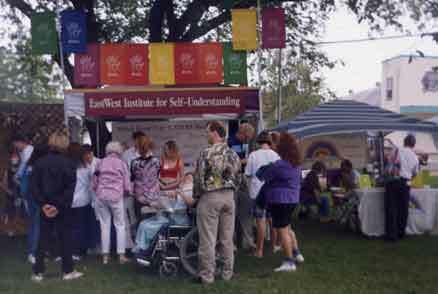 We operated as the "EastWest Institute for Self-Understanding." Our prices were clearly posted and were reasonable. We had free informational handouts and provided a short free sample palm reading. Our "gimmick" was to raise a question about which type of hand a person had and to make it easy and fun for them to check it out at the table in our booth. The prospective clients were on the outside of the booth while I was on the inside of the booth. The table between us provided a feeling of safety for people passing by because they were outside and free from any charges. Also, there were many subtle signs that said, "Free". My challenge was to get them inside the booth for a paid palm reading. The free offer to the prospective client was for us to look at his or her hands and see if they were similar to one of our model hands shown in our free handouts. It was no accident that our handout samples were respected types of people: manager/leader, psychic, romantic lover, or artist. Of course, most people would like to hear that they are similar to some special type person, especially if it is announced in public and free! When the curious perspective client extended his or her hands for examination, I touched them gently and pointed out one or two characteristics that go along with one of our samples in the free handouts. I also pointed out one or two additional exceptional indicators they had. These were usually associated with the thumb because there are so many good thumb indicators. I showed and explained the particular indicator (such as large thumb angle and end zone) to all present thereby "capturing" the interest of more perspective clients. I explained in detail to all present what the indicators were and what they meant. By that time, there was a group of people all looking at their hands. I asked if that seemed to "fit" and that got him or her to talk a little. Soon we got a little discussion going on that subject, being sure to include all people present. Then I explained that we could do a 15-minute reading on their thumb and the many other indicators in their hands for only a small fee, usually $5 or $10. The subtle message was that there are many interesting indicators in the hands that they could find out about for a low fee. It was clear that I was no threat, and they were safe and special -- which they were. I want to emphasize that my students and I always looked for and described legitimate and reliable positive palm reading indicators in the person's hands. Our intentions were always to help the client to better understand themselves. We never watched the clock when doing palm readings, and we ran overtime beyond the 15-minutes usually. 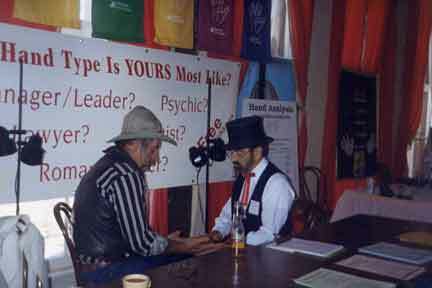 We very often had a waiting list for people waiting to get a palm reader. Hugs afterward were common because holding hands for nearly a half hour brings people very close! Usually, I showed in detail how their thumb was angled and explained clearly what that indicated - with friendly fun. (To a young woman: "Wow, your thumb would give most men 'thumb envy'!) The hook was that they understood the thumb indicator explanation but did not get an explanation for their other indicators I mentioned. At this point, a clear offer was made to them: "For a very small fee for our expert palm reading we could tell you what all those indicators mean." If they didn't want to part with their money, they were welcome to take a free handout to check their friend's hands. In all cases, I tried to make them feel as if they got something good and left with a good feeling about us. 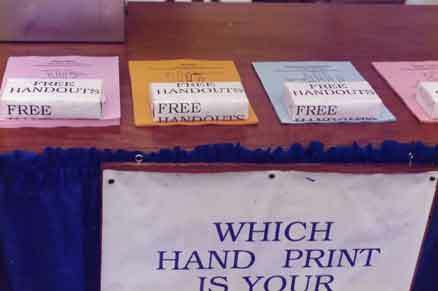 The free handouts were drawings of idealized hands with the strongest markings explained for each particular type person. We did not just sit passively waiting for people to stop and take a handout and look us over. I was a great showman and worked the crowd from the table at the front edge of the booth. I reached out to invite anyone in shouting distance, "To come find out which hand theirs was like!" I developed a good "line of chatter" and kept my palm readers (my students) busy most of the time the events were open. My deal with my students was that I set the price for each event, and that was either $5 or $10 for a "15 minute reading", depending on the area we were in. I paid the booth space rental fees (up to $450) and worked the crowd to get clients for the student palm readers to work with. The students did the readings (15 to 30 minutes), and I got half of all money we took in. At our best locations with high crowd traffic, we took in $1200 to $1700 during the weekend. In all cases, we had a lot of fun! In some locations we wore costumes, such as at Carson City, Nevada. [I'm on the right above.] We were in the upstairs of a gold-rush era saloon during the city's Gold Rush Days Celebration. We had a lot of fun with both the local people and the tourists. The guy here with me was a local who had a "job" at the saloon just talking to tourists and getting his picture taken with them in his western outfit. He said he worked for "beer money". 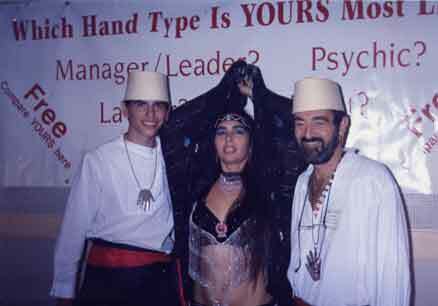 For about four years I conducted classes and the students and I attended many fairs and events doing palm reading. It was a lot of fun! We met many interesting people and made a little money while having a great time. But after awhile it became work, so I abandoned both the classes and moved on to other things, such as making websites. The reality is that there are easier ways to make money than reading hands! However, not many things are as interesting and as much fun to do as is palm reading.